The temple is dedicated to Lord Sree Venkataramana. Built in 1450 AD, legend has it that a family of Gowda Saraswat Brahmins (namely Soire Prabhu and Soma Sharma) brought Lord Venkataramana’s idols along with them while migrating from Goa which they installed in Karkala. Successive generations of that family settled in Karkala itself. They continued the worship of the Lord and constructed a temple for Him, where they could pay due obeisance to the Lord. As days passed by, the glory of the Lord spread far and wide, and the temple became famous as “Padu Tirupthi”. 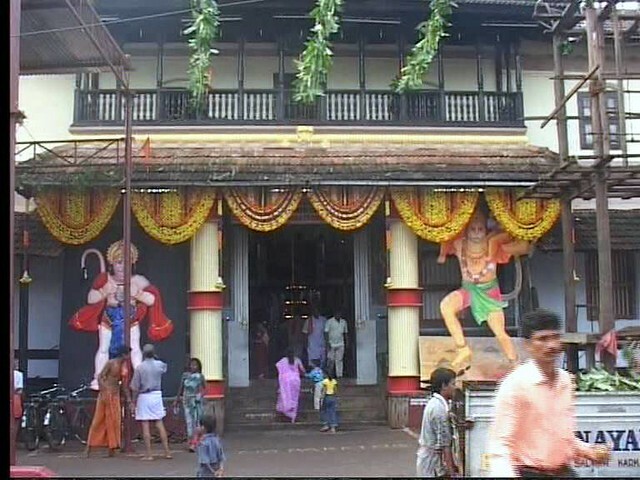 The temple is built in traditional style and considered the most important attraction of Karkala. The principal deity of this temple is Lord Venkataramana. The temple structure stands in the centre of the city, which attracts lakhs of devotees throughout the year. Popularly known as Padutirupathi ; The Kannada word PADU means west. This place is considered very sacred by the devotees, as they believe that the Lord will grant all their wishes. This majestic building reflects the architecture that was prevalent in ancient South India. The rites and rituals followed at this temple are similar to those of the Tirupathi Temple at Thirumala, Andhra Pradesh. According to legends this temple is an extension of Tirupathi. Since this temple is related to Tirumala it follows the same rituals as in Tirupathi Temple. In the morning at 6:00AM (in some cases it is 5:30 am during Ashwija Month) the temple doors are opened with Dwara Pooja and Suprabhatam. Dwara Pooja is performed for the door keepers Jaya-Vijaya (in Vishnu Loka they represent DwaraPaalakaas). Suprabhatam is a special slokha recited to wake up the Lord from his sleeps. Then after the end of Suprabhata Nirmala Visarjana (removal of old flowers and decoration of new ones to deities) is performed with Ganji Naivedyam (serving of rice and rice item foods, including Navaneetham-mixture of butter, til and sugar) at about 6:30 am. At 10:00 am Panchaamrutha abhishekha is performed for the Saligrama. This abhishekha is a typical one as performed in Tirupathi. In Tirumala this is performed on Lord Venkateshwara’s Stone Statue and to honour the same here it is performed on the Saligrama. In the afternoon at 12:00 pm Naivedyam is performed wherein several items are served for the lord in a huge plate and utensil made out of copper. Once the Naivedya is over little bit of rice is served in small utensils and is kept in front of Parivar Devas while one is offered to Sree Veeramaruthi Temple. After this Maha Puja is performed at 1:00 pm, this is called here as Raajopchaara Puja. The temple doors are closed after this for Vishrama Seva. Late in the evening at about 6:00 pm, temple doors are again opened with lighting of oil lamps. A special shlokha is sung called as Deevtige Salaam Shlokham. Recorded cassettes of bhajans are played on loud speakers at this divine time of sunset. At 6:30PM people from all over the town come to temple to sing the hyms of Lord Almighties and this goes on until 8:00 pm. At 8`O clock again Naivedyam is offered with Mangalaarthi. Once Mangalaaarthi finishes night Utsava is offered, this is usually an outing to the town except on Amavasya and Ekadashi. Once Utsava returns to temple there are five rounds inside; first one being Vaadya Sutthu(Instrumental), second and third is Rigveda and Yajurveda Sutthu, fourth is Sangeetha Sutthu (Yakshagana’s Thaala Maddhale) and last one is Sarva Vaadya Sutthu. After the utsav ends with Vasantha Puja (Lord is given Uyaala Seva with recitals of shlokhas) deities are put to sleep which is known as Ekaantha Seva (11:30PM or on festive days depends on time taken).